2017, June — Hello World by Murray Ewing (Bookship). 2015, Nov — The Fantasy Reader by Murray Ewing (Bookship). Mewsings post: The Fantasy Reader. 2012, Feb — “The Realm of Lost Things” in ASIM 53. Mewsings post: “The Realm of Lost Things” in ASIM 53, and Gene Wolfe being honoured. 2011, Sep — “Elven Brides” in Full Fathom Forty, the British Fantasy Society’s 40th anniversary anthology. Mewsings posts: Full Fathom Forty • Full Fathom Forty lineup. 2011, Apr — “A Night as a Scarecrow” in The BFS Journal (Dark Horizons) Spring 2011. Mewsings post: “A Night as a Scarecrow” in BFS Journal, Spring 2011. 2011, Jan — “Zathotha” in Cyäegha #4. Mewsings post: “Zathotha” in Cyäegha issue 4. 2007 — “The Bookshop” in Dark Horizons #50 (The British Fantasy Society). 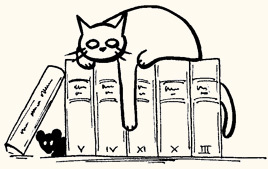 Mewsings post: The Bookshop, or two of them anyway. 1989 — “The Task Completed” in Cosmorama #2 (King Rat Press). 1988 — “Blood of the Goddess” in Start Up (+2 Free Turns) #2. Produced for a 40th birthday giveaway, My Vampire Bride is Poe-esque gothic melodrama poem, printed in an A6 booklet, produced in a limited run of 40 copies. You can now read the poem on this site. Mewsings post: 40th Birthday Giveaway. 2010 — Alice at R’lyeh (16-page booklet), poem plus illustrations. This project can be read on the Alice at R’lyeh section of this site. Mewsings posts: Alice at R’lyeh • Alice at R’lyeh for your ears • The Alice at R’lyeh Report, part 1 • and part 2. Collecting Mewsings posts on Le Guin’s Earthsea in a Kindle ebook. Collecting Mewsings posts on Alan Garner’s novels, plus one new chapter, in a Kindle ebook. 2013, Nov — “David Lindsay’s The Violet Apple” in Wormwood #21. Mewsings post: “David Lindsay’s The Violet Apple” in Wormwood 21. 2011, May — “The Haunted Man” in Around the Outsider: Essays Presented to Colin Wilson on the Occasion of His 80th Birthday edited by Colin Stanley (O Books). An essay about Colin Wilson’s writings on David Lindsay. 1997–1998 — Reviews & articles for Cybernet2000 (SF & Fantasy webzine). Mostly book reviews. You can read a couple of articles I wrote for Cybernet2000 in the Misc section of this site. A non-fiction fanzine dedicated to fantasy. Some of the essays I wrote for it can be found in the Nonfiction section of the site index. 2014, Nov — Yes, You ARE A Monster by Edweard Deadwitt & Murray Ewing (Bookship). A self-help book for would-be monsters. 2012 — Cartoon of Gene Wolfe, used on the website & booklet for the Evening to Honor Gene Wolfe. 2011 — Full-page illustration for “The Music of Erich Zann” in Lovecraft Black & White (Dagon Press). Mewsings post: Lovecraft Black & White. Mewsings post: The Laughing Ghost. Mewsings post: Spacewreck (2017 re-release). 2014–2016 — The War Films Podcast (at The War Film Podcast Blog). Mewsings post: The War Films Podcast. 2011 — The Adventure Films Podcast (at The Adventure Films Podcast Blog). Mewsings post: The Adventure Film Podcast. 2016 — The Television Crossover Universe Podcast #17 (at The Television Crossover Universe, and iTunes). Mewsings post: The Television Crossover Universe podcast interview.